Everyone knows that hand washing is imperative to keep the spread of germs at bay. But, some hand cleansers aren't appealing. The fragrance can be overpowering and the soap can cause your hands to become cracked and brittle. When choosing a hand soap for the guest bathroom, consider how you would like your hands to feel. Our household uses Dial Sugar Cane Husk Scrub Hand Soap. When choosing a hand soap for the guest bathroom, it is best to consider a neutral fragrance soap. No rugged, tough man wants to smell like flowers and buttercups. Still, a boring bar of soap isn't appealing atheistically or hygienically. A more neutral scent can be appealing to men and women as well as young and old. The Dial Sugar Cane Husk Scrub Hand Soap offers a pleasant, yet not over powering sweet scent. It isn't too girlie for the men nor is it boring for the women. Plus, is the soap moisturizing and leaves skin smooth. It's almost as if you have put moisturizer on after washing your hands. Like other homes, our guest bathroom gets a lot of use from the kids. Any parent can attest to the dirt and grim on a child's hands after just a small amount of time playing outside. Since I suggest (not really, more like demand) that the kids go directly to wash up as soon as they walk in, I want a soap that gets the job done. The Dial Sugar Cane Husk Scrub offers a deep clean. The micro-scrubbers help remove all the dirt, grime and general ick that accumulates on the kids' hands. More importantly, their hands get clean in one washing (no parent wants to stand over the sink and re-wash hands). One pump and a birthday song later and the kids are ready for dinner, homework or what ever else you have planned. The Dial Sugar Can Husk Scrub is part of the Boutique Collection. In addition to the Sugar Cane Husk Scrub, the Boutique Collection offers Yellow Raspberry and black sugar, Water Blossoms, and Coconut Lime Verbena. This collection, along with other Dial products, are available at most major retailers. Would you like to add the Dial Sugar Cane Husk Scrub to your guest bathroom? I have three (3) free product coupons to give away. Please use the Rafflecopter to enter. 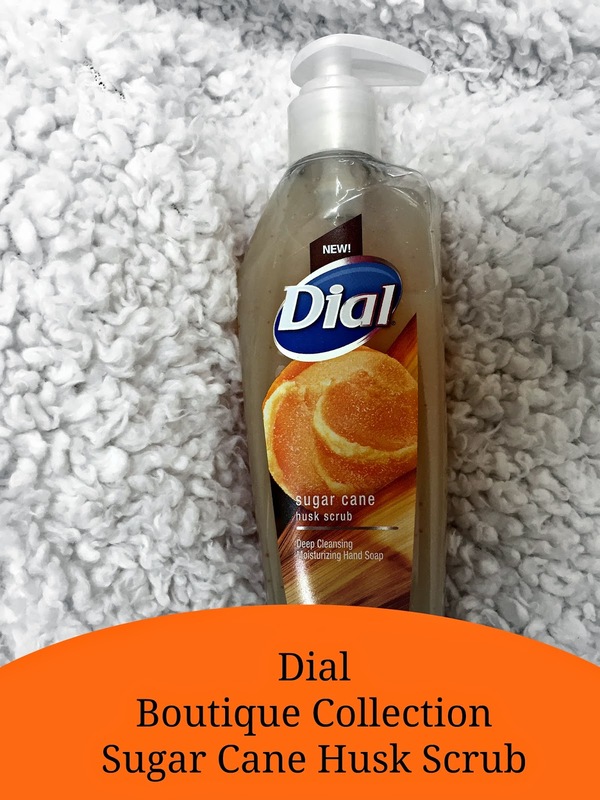 Disclosure: The Dial bran provided me with a sample of Dial Sugar Cane Husk Scrub Hand Soap in exchange for a product review. All opinions are my own.